The global solar market, historically dominated by Europe, is starting to shift. As the shakeout in the solar industry continues, it will take a while for the dust to settle. Although the future is murky for many solar photovoltaic companies, two things are becoming clear from last year's installation figures: the world is installing more solar than ever; and that solar is being deployed in more countries than ever. According to preliminary figures from the European Photovoltaic Industry Association, the solar PV industry installed more than 30 gigawatts worldwide in 2012 -- bringing cumulative global installations to more than 100 gigawatts. It was only in 2008 when the wind industry -- considered the most mature of renewables -- surged past the 100-gigawatt global capacity mark. "No one would have predicted even ten years ago that we would see more than 100 gigawatts of solar photovoltaic capacity in the world by 2012," said EPIA President Winfried Hoffmann in a statement. "The photovoltaic industry clearly faces challenges but the results of 2012 show there is a strong global market for our technology. Even in tough economic times and despite growing regulatory uncertainty, we have nearly managed to repeat the record year of 2011." Last year also marked a geographical shift in the solar industry. 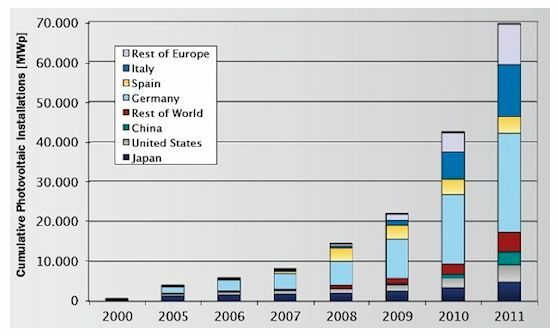 In 2011, there were only 8 gigawatts of projects installed outside of Europe. 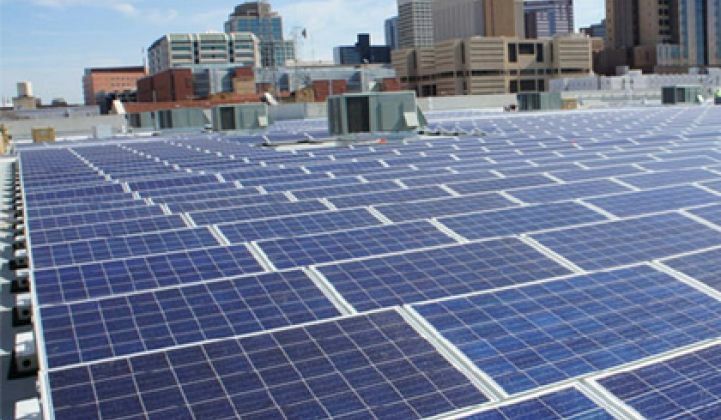 In 2012, the amount of solar capacity installed outside of the region increased to 13 gigawatts. Once again, Germany led the world with another 7.6 gigawatts. The U.S. and China started playing catching up, however. Helped by a fourth-quarter surge, America installed 3.2 gigawatts last year -- setting it up for a possible 3.9 gigawatts year in 2013. China installed between 3.5 gigawatts and 4.5 gigawatts in 2012. Other regions are emerging as well. According to a report from GTM Research, the Middle East and North Africa could install 3 gigawatts annually by 2015. The 2012 figures are not final. EPIA says that another 1 to 2 gigawatts could be added to the final tally when it gets released in May.